I could eat cookie dough for hours (forever?). In fact, I’ve been snacking on quite a bit of it after creating my new favorite cookie recipe of all time, Maple Pecan Oatmeal Chocolate Chippers. But all that sugar, all that fat, all that dessert-y type stuff, I know it’s not good for me, especially in high doses. Not surprising: I’ve been struggling with sugar and food in general due to stress. Now that I have a few months to really focus on myself, I’ve decided to start by keeping a food diary for a short period of time. I’m not into long-range calorie-counting. In fact, it makes me crazy and isn’t good when you consider my disordered past. But I do think the exercise of writing eats down can be a good one to just see a.) what you’re eating in general and b.) how much of it you’re consuming versus activity, etc. So, this is how these 100 calorie cookie dough bites came to be. 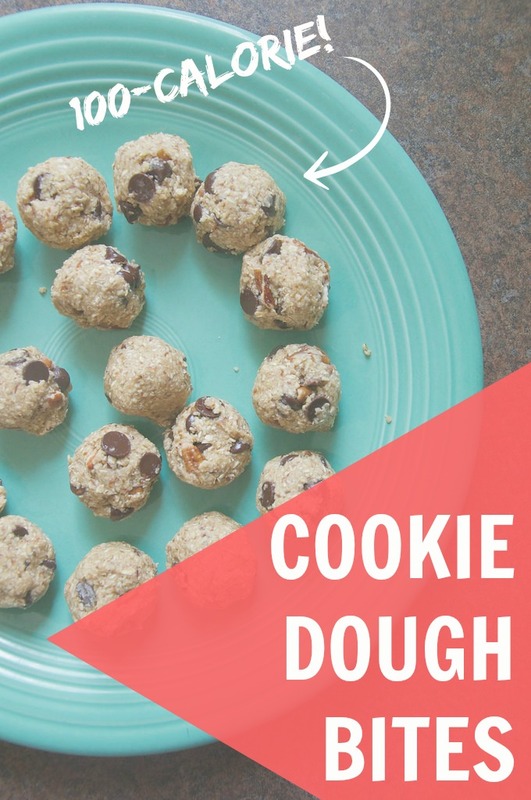 I won’t go nuts and call them “healthy” -- they contain less than 2 grams of protein per serving -- however, they are somewhat toned down from the ingredients in my usual cookie recipes. And they’re portioned out . . . versus the hugely rounded gobs I usually spoon into my mouth. It’s something in the right direction. In your food processor, pulse oats into flour and mix with the coconut flour. Set aside in a large bowl. Put the Earth Balance, coconut oil, maple syrup, and flax meal in the food processor. Pulse into well incorporated. Add the wet ingredients to the dry and mix with a spatula until everything is moistened. Fold in the pecans and chocolate chips. Then portion out by tablespoonfuls onto a plate. Place in the fridge to firm up, then store there for the week. 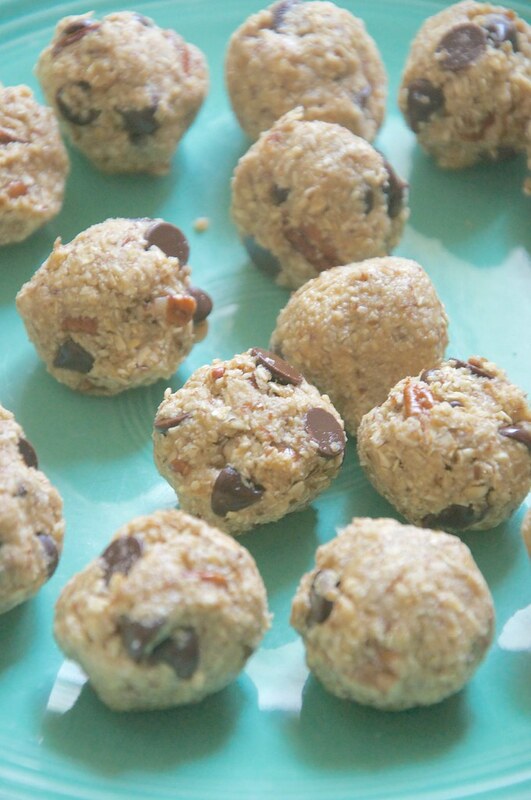 // This recipe makes 18-20 tablespoon-sized balls. Between 95-105 calories.